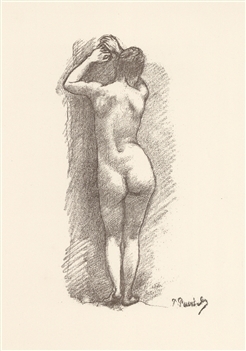 Medium: lithograph. This impression is from the rare 1897 portfolio "Art et Nature" by Leon Roger-Miles, published in Paris by Boudet in an edition of 525. Printed on Marais wove paper, the sheet size is 12 3/4 x 9 1/2 inches (325 x 238 mm). Signed in the plate, not by hand. Condition: there is foxing near the edges of the sheet.